It’s Sunday morning and time for another Sunday Scan! 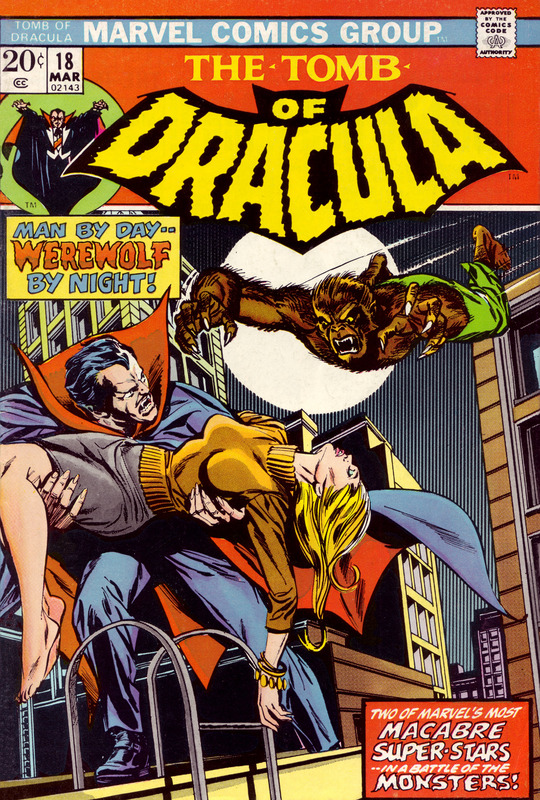 I recently finished collecting all 70 regular issues (and the magazines and Giant-Sized specials) of Marvel’s legendary Tomb of Dracula series from the 70’s. So now I am reading them straight through so expect many more issues to be featured in future Sunday Scans. This is the cover to issue #18 (1974). The art is by Gil Kane with inks by Tom Palmer who probably did the coloring as well. The Grand Comic Database also lists John Romita Sr. as doing “alterations” to the werewolf figure. I suppose there was something “wrong” with the way Gil Kane did the werewolf that needed some adjustment/correction? Anyone have anymore info on this please contact me.